They are very handy as a sturdy base around which to do the cold molding. I am reading more about structure and boat engineering as well as about cold molding techniques and I think I can make a go of the boat, with a small change. I will cold form the boat from the outside of the structure I am building, then I can add some internal structure back in, but focus on a lighter weight version of the original internal supports. The fact that I used expensive marine Okoume plywood for the mold is not so great. 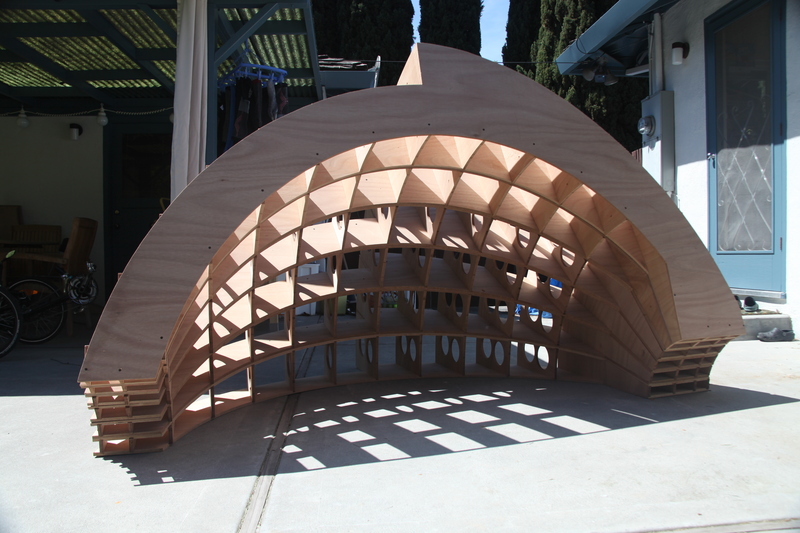 On the positive side though… I learned a lot about the weight and characteristics of the plywood. For one, it holds screws very well, even on the end. Its 9 ply and tough stuff. Perhaps I will be able to trim down the existing supports and reuse them in the walnut after all. For now though… I am thinking of the structures as mold elements. Today, more cutting, and assembly. I have 9 supports done, 8 dry-fitted and screwed together, and parts for another 2 in the shop. I’ll see if I can make a mold for half the boat, and then release the first run, repeat, and then join the two halves. This would save a lot of time on building (or overbuilding) the mold forms.